January 16, 2018 Spectrum Chemical Mfg. Corp. Essential oils serve a variety of purposes in the health and beauty industries. These concentrated hydrophobic liquids are derived from a plant’s leaves, bark, roots, seeds or other sources, and emit a concentrated aroma that is the ‘essence” of the plant. The oils are extracted from plant sources through distillation, solvent extraction, cold pressing and other methods. Many of these extracts are considered to have strong aromatherapy benefits, with olfactory impulses creating calming or stimulatory effects. Beyond these aromatherapy benefits, some of the most interesting essential oils are used as antiseptics, astringents, rheumatics or diuretics. Cinnamon oil is one of the strongest antibacterial essential oils. A 2006 study demonstrated Cinnamon’s strong activity against a number of common bacteria. Tea tree oil is another powerful antimicrobial, with research supporting faster healing time when it is introduced into infected wounds. 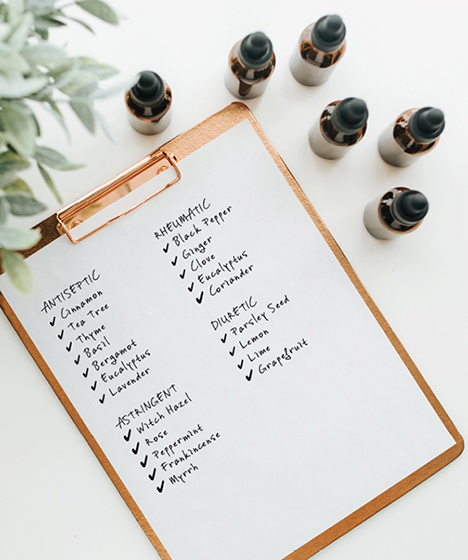 Other essential oils demonstrating antiseptic, antibacterial, antiviral or antimicrobial properties include thyme, basil, bergamot, eucalyptus and lavender. Astringents are commonly used in facial skin care because of their ability to shrink pores, presumably by causing the skin protein keratin to contract under the cooler or acidic conditions caused by astringents. Chemicals such as alcohol or salicylic acid are astringents but can severely dry the skin. Witch hazel is a milder alternative, exhibiting astringent properties without excessive drying. Even milder essential oils with such properties include rose, peppermint, frankincense and myrrh. Research suggests that spices could be used as anti-inflammatory agents, possibly fighting heart disease, cancer, Alzheimer's disease and arthritis. Particularly, black pepper and ginger oil are known to relax blood vessels, stimulate blood flow and relieve pain. Other essential oils that demonstrate anti-inflammatory, anti-proliferative and anti-hypercholesterolemia properties include clove, eucalyptus, cinnamon and coriander. Parsley seed oil can be used as a natural diuretic that helps to relieve water retention and bloating. Studies show that the oil stimulates urine production in the kidneys and draws out excess water that can cause peripheral edema. Citrus essential oils, such as lemon, lime and grapefruit can also be used as a natural diuretic by activating the lymphatic system and helping to control fluid retention, according to a 2016 study. Quality Matters – Are All Essential Oils The Same? Whether used for aromatherapy or in other skin care remedies and fragrances, the price and quality of essential oils can deviate greatly. Aspects that can influence the quality and price of the oil include the scarcity of the botanical, the country of origin, the growing climate and conditions, quality standards of the distiller and the amount of oil that is produced by the botanical. Spectrum Chemical not only carries more than 1,000 USP grade chemicals for personal care and cosmetic formulation, but also carries more than 100 essential oils used every day by personal care formulators. Spectrum has rigorous in-house analytical testing capabilities to ensure that each of these essential oils meets Spectrum’s stringent quality standards. View the entire list or download our essential oils brochure.